Disney has been playing I Spy in their movies for decades. The next time you pop in one of these films, keep your eyes peeled for a few characters having out-of-movie experiences. Rapunzel and Flynn from Tangled showed up for Elsa’s coronation in Arendelle. Eagle-eyed fans can spot some of their other favorite Disney canines During the Twilight Barking scene of 101 Dalmatians. Watch for characters from Lady and the Tramp, including Peg, Jock, and both title characters. You can spot more Disney dog cameos in Oliver & Company—Jock and Peg again (2:45), plus their pal Trusty, and Pongo from 101 Dalmatians. Also, did everyone know that Oliver is voiced by Joey Lawrence? I didn't. Mind blown. It’s one of the lesser-known Disney films, but if you’re of a certain age, you’re probably familiar with The Great Mouse Detective, featuring the incomparable Vincent Price as the villain Ratigan. If you haven’t seen the movie, you can still catch Ratigan if you squint really hard in Oliver & Company—he’s featured in a picture frame on a table during the song “Perfect Isn’t Easy.” It's a silver frame on the upper left side. Check out the King and the Grand Duke from Cinderella during the wedding scene in The Little Mermaid. A version of Mrs. Potts and Chip Cup can be seen in a camp scene of Tarzan. Try 1:12. They're not as animated as you might remember them from Beauty and the Beast, but it's definitely them! In the beginning scenes of The Princess and the Frog, a little girl can be seen shaking out a rug that looks an awful lot like Magic Carpet from Aladdin. The animators must have been fans of the 1992 movie, because you can also catch a glimpse of the Genie’s lamp during the “Dig a Little Deeper” number. Here's Carpet at 0:52. Some of the “cameos” in Aladdin are obvious tongue-in-cheek references—the Goofy hat Genie wears while sporting a Hawaiian shirt at the end, for example. But for a more subtle appearance, look for the Beast as one of the Sultan’s toys. 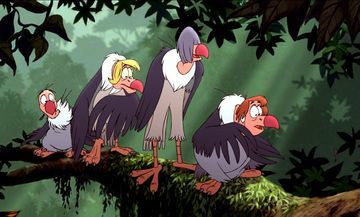 Though not confirmed, it's been pointed out that the little vulture also looks a lot like the Jungle Book vultures. Since The Hunchback of Notre Dame takes place in France, it’s really not so surprising that everyone’s favorite well-read mademoiselle makes a brief cameo... with her nose stuck in a book, no less. This video also shows cameos by Magic Carpet and Pumbaa. I wasn't so sure about the Pumbaa claim, but Snopes backs it up. If you've got a soft spot for Bambi and his mom—and seriously, who doesn't—you can see them reunited at 0:35 below, the "Someone's Waiting for You" song from The Rescuers. Pixar is notorious for sneaking little nods to upcoming projects in films. For example, the Pizza Planet truck from Toy Story appears in movies even where it doesn’t make sense—like 10th-century Scotland. Here are a few more Pixar cameos in other Pixar movies. This is just a smattering—there are tons more cameos out there, including some that probably haven't even been discovered yet. Let us know which ones you've spotted!